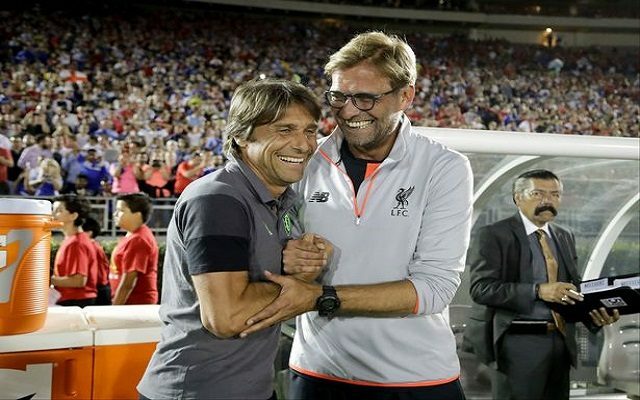 Jurgen Klopp has been gushing with praise for opposite number Antonio Conte ahead our clash with Chelsea on Friday night. In his pre-match press conference, Klopp called the Italian the Pep Guardiola of Juventus. As a manager, he won three consecutive Serie A titles with Juve in 2012, 2013, and 2014, as well as two Supercopas in 2012 and 2013. He then left Juve and took over the Italian national side, taking them to the quarter-final of Euro 2016 before losing to Germany on penalties. His success has cemented him as a Juve legend. Like Pep at Barca, he was also a player before becoming a manager, winning a host of silverware including four league titles and one Champions League title. We have already played Conte’s Chelsea once this season, going down 1-0 during our tour of the USA. The game is better remembered for Loris Karius’ injury than the quality of football on the pitch.